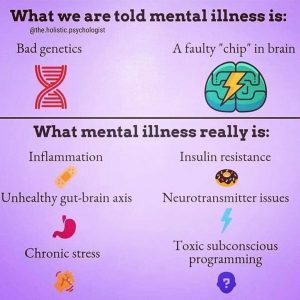 There are only two things listed in this meme that are the cause of what is misunderstood and LABELED as MENTAL illness, but is really Emotional distress. They are (1) Chronic Stress and (2) Toxic subconscious programming. Until the so-called modern medical establishment separates the MENTAL from the EMOTIONAL – this same type of TOXIC SUBCONSCIOUS PROGRAMMING will continue.. SSDD. This entry was posted in Feelings - Emotions, Health & Wellness, Imprint-programs-beliefs, Medical - Drugs, Self-Empowerment, Society - Culture, Soul (Will) - Intuition-feelings-emotions, Spirit - (Mind) Thoughts - ideas and tagged medical establishment, mental illness by johnrieger. Bookmark the permalink.